The first people appeared in our area somewhere about 150,000 years ago. According to modern historians, they had a brain of insignificant volume, a low forehead, massive jaws and large teeth..." The settlements of the primitive people were found in the outskirts of the city and on Monastyrskiy Island. 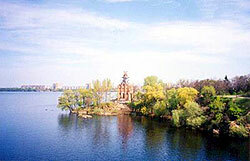 This unique island appears throughout the history of Prydniprovye, constantly being in the center of events. As a matter of fact, it is also the ancient nucleus of the city. After the last Ice Age - 10 thousand years ago - the settling of the Prydniprovye area began more intensely. In ~3500-2700 BC the first farmers lived here (the so-called Tripolskaya culture people). 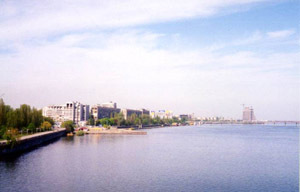 The mighty, broad Dnieper River (Greeks called it the Borisphen) with its picturesque islands and peaceful backwaters, lush flood-meadows and shadowy oak woods stretches along river valleys and ravines. Abundant game and fish in local forests and waters are a result of good climate and vast fertile land... All this attracted hunters, fishers, cattle-breeders and land-tillers to these parts. 3000 years ago the cattle-breeders came from the East - Cimmerians, written about by Homer and glorified by Hollywood ("Conan the Barbarian"). They gradually overcame the Scythians (~ 700 BC), who were known for their graceful creations from bronze and named as a frontier area of ancient civilization (Crimea). The invasions from the East proceeded and in 200 BC the Sarmatians came here. They won and assimilated the rests of Scythians.